Schloss Mönchstein is a castle at a cliff of the Mönchsberg Hill in Salzburg, overlooking the city centre. It is one of the most "outstanding" buildings of the city in terms of exposure and is visible from pretty much any corner of the old town. The peach-coloured building was shaped in the 19th century and is therefore a Historicist piece of ugliness. However, the origins of Schloss Mönchstein actually go back to a proper Medieval castle. 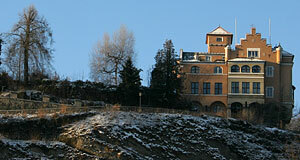 For many years, Schloss Mönchstein is managed as a luxury hotel. Older names of Schloss Mönchstein include Tetelheimer Turm, Mönchsteinturm ("Turm" means "tower") and Leitner Villa. The first building on this site, which dated back to the 13th century, was named after the Tetelheim family, a dynasty of judges from the Waginger See in today′s Bavaria. The Fröschelheimer family then owned the tower and the vast stretches of land associated with it from 1419 to 1565. Then it was sold to Wolf Windisch, a wealthy local, and most of the northern section of the Mönchsberg became known as "Windischberg" (to be precise, the area between the Bürgerwehr and the Augustinian monastery). The mentioned monastery was one of several owners before the property was sold to the University of Salzburg in 1654. The university used the little castle as a residence for professors. The chapel of Schloss Mönchstein, which was first mentioned in 1541, was modernised and re-consecrated in 1661. With the secularisation of Salzburg, the university lost its status as a full university and much of its property. This included Schloss Mönchstein, which was sold in 1813. First to a high-ranking Bavarian civil servant, later to a local from Salzburg and again in 1887 to the banker Karl Leitner. The latter hired Salzburg′s most famous architect of his time, Jakob Ceconi. Leitner′s widow sold Schloss Mönchstein to Bela Veith, a high-ranking Romanian civil servant in 1917. Once again, the new owner had several drastic "modernisations" done to the castle, which resulted in the current appearance. The sons of Bela Veith started to operate Schloss Mönchstein as a hotel, alas, with little success. They struggled with severe economic difficulties and had to start co-operations with various investors since the 1950ies. Nonetheless, Schloss Mönchstein was soon known as a high-end hotel in Salzburg and has been popular ever since, especially among guests of the Salzburg Festival. Recent renovations were done in 1965 and again in 2009, when a new and modern conservatory was built by the local architect Volker Burgstaller (he of the Hangar-7 at the airport). Hotel Schloss Mönchstein is not a tourist attraction per se; in a way, it is open to the general public, but only as far as a hotel generally is.